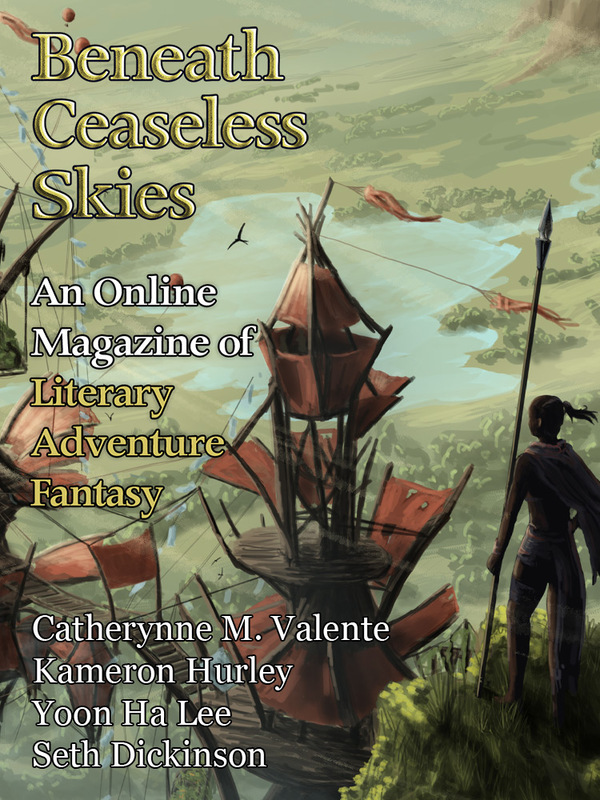 Beneath Ceaseless Skies | BCS Issue #200 Subscription Drive! BCS Issue #200 Subscription Drive! To celebrate our 200th issue, we’re having a BCS Subscription Drive! UPDATE: our first goal is unlocked! BCS has raised our word-count limit to 11,000 words. Subscribe now, and help us raise it to 12,000 or even 15,000! BCS ebook subscriptions, available exclusively at WeightlessBooks.com, are only $15.99 for a full year/26 issues. (That’s less than 30 cents a story!) Subscribers can get issues delivered directly to their Kindle or smart phone, and they get new issues early, a week before the website. Forthcoming authors in BCS include Marie Brennan, Gregory Norman Bossert (whose first BCS story “The Telling” won the World Fantasy Award), Mishell Baker, KJ Kabza, Stephanie Burgis, Tony Pi, Catherynne M. Valente, Kameron Hurley, A.M. Dellamonica, Claude Lalumière, and more. From now until June 3, if you buy a BCS ebook subscription or renew your existing subscription (you can renew at any time), you can help unlock our drive goals. Since BCS #1 in 2008–200 issues, 419 stories!–over a third of our fiction has been novelette-length or longer. Longer stories work great for awe-inspiring fantasy worlds, like you’ll find in every issue of BCS. Our word-count limit for submissions, 10,000 words, has always been among the longest if not the longest of pro-rate online magazines. With your help, we’d like to make it even longer! At 25 new/renewing subscribers, BCS will raise our submissions word-count limit to 11,000 words. At 50 new/renewing subscribers, we’ll raise our word-count limit to 12,000 words. At 100 new/renewing subscribers, we’ll raise it to 13,000 words. At 200 new/renewing subscribers, we’ll raise it to 15,000 words! Every subscription makes a difference in helping us pay our authors, for their great stories of all lengths. Weightless Books also has the annual Best of BCS anthologies and bundles of BCS back issues, including new epic bundles of 100 and all 200 issues! Delivered straight to your Kindle or smart phone. All proceeds go to pay our artists and authors. Thank you for your support of BCS!